An on-site restaurant and free Wi-Fi are among the highlights of a stay at the pet-friendly Inn at Reading. The two-story hotel's 170 rooms offer coffeemakers with Starbucks coffee cable TV upscale toiletries and free Wi-Fi. Stay in shape in the on-site fitness room and print a boarding pass or catch up on work with the guest computer and copy and fax service in the lobby. Unwind in the evenings with cocktails a game of billiards and English pub grub at Publick House Restaurant and Tavern. During summer months float in the outdoor heated pool or dine poolside at the cabana bar and patio. There are conference rooms and event space on site to accommodate up to 950 attendees. The front desk is open 24 hours a day for your convenience. Pets are welcome and parking â?? including spaces for buses RVs and trucks â?? is free. 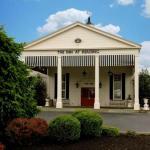 The Inn at Reading is off U.S. 422 a quarter-mile west of the Schuylkill River and two-and-a-half miles from downtown Reading attractions like the Reading Public Museum. The hotel is five miles from I-176 and 14 miles from I-76. Restaurants a movie theater and Berks County Park are within walking distance. The VF Outlet Center is just one mile away. Reading Regional Airport is four-and-a-half miles from the hotel while Lehigh Valley International Airport is an hour away by car.